The stock market in Chile collapsed when socialist president Allende was elected back in the 1970s but soared when he was overthrown and military dictator Pinochet seized power. Economic growth can be achieved either by the ballot or by the bullet. Or to put it another way democratic means of political system can drive economic growth. However in some countries democracy fails to deliver economic growth due to a variety of factors. In these countries, economic growth has been achieved when democracy was replaced by military rule. Though this is a controversial theory, it proved true in the South American country of Chile. Salvador Allende was democratically elected as the President of Chile in 1970. However his socialist policies and anti-business sentiment did not go well with the business elite and overseas investors. As a result, the his government was overthrown in a bloody coup engineered by the US and military dictator Augusto Pinochet took power in 1973. According to a research paper by Daniele Girardi and Samuel Bowlesy, the Chilean stock market plunged by 22% in the first trading after Allende’s victory and stock prices continued to fall in the following days stabilizing after a decline of about 50% of the pre-election values. When brutal dictator Pinochet took power in 1973, the trend reversed completely. In the first trading day after the coup, stock prices soared by nearly 80%. Stocks continue to move higher in the years that followed. 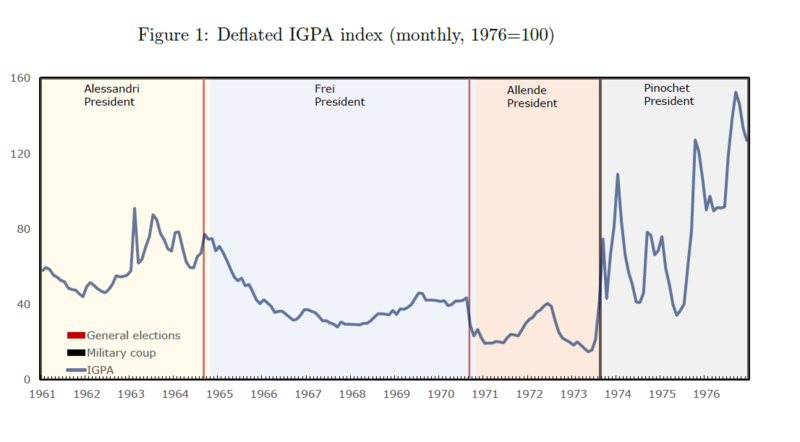 Source: Institution shocks and economic outcomes: Allende’selection, Pinochet’s coup and the Santiago stock market by Daniele Girardi (University of Massachusetts (Amherst)) and Samuel Bowlesy (Santa Fe Institute). It should be noted that Chile’s economic and equity market growth during those turbulent years came at a heavy cost in terms of human lives. Thousands of people were killed or disappeared by Pinochet in order to maintain power and implement his radical policies. Though the concept of growth at all costs worked in Chile it may not work in all countries. So the idea that if democracy does not bring prosperity simply replace it with military dictatorship is utterly wrong to say the least.